We first opened our doors in January 1996 with a handful of gowns in our Grantham shop. Since then we have had the privilege of dressing thousands of brides and their maids, we are now very proud of the reputation we have today. When visiting our shop you can be guaranteed a friendly personal service. With over 20 years experience we have the knowledge to provide a first-class experience when choosing the most important dress you will ever wear. We stock bridal gowns from leading suppliers such as White Rose and House of Nicholas and ensure our choice is varied to suit all shapes, sizes and budgets. Our exclusive collection of bridesmaid and flower girl dresses are made to order in-house, offering you a unique flexibility. On hand are a team of skilled seamstresses to make any alterations you may require. 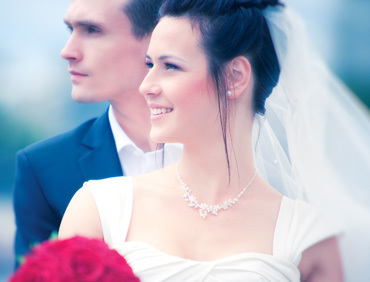 Together with veils, tiaras, and jewellery, we will help to create that perfect look for your special day. Take a look at our very own Christening and Communion wear, all handmade in the UK, a stunning collection for boys and girls. Calling all prom queens and party princesses. We are excited to be a stockist for “Prom frocks UK” Beautiful dresses for prom/evening wear. School exclusivity, 1 dress per colour per school.